Fresh peas straight from the garden are sweeter than anything you can buy at the store. 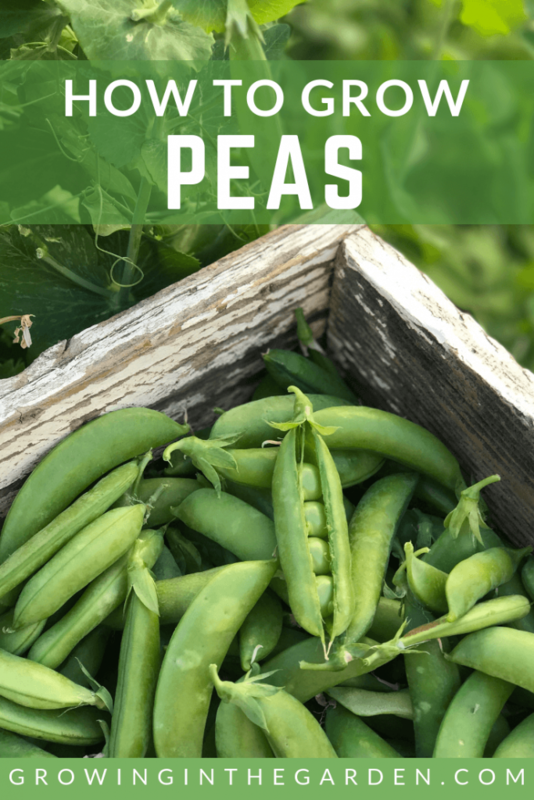 Peas are easy to grow in your garden, and because they normally grow vertically, provide a high yield in a small growing area. 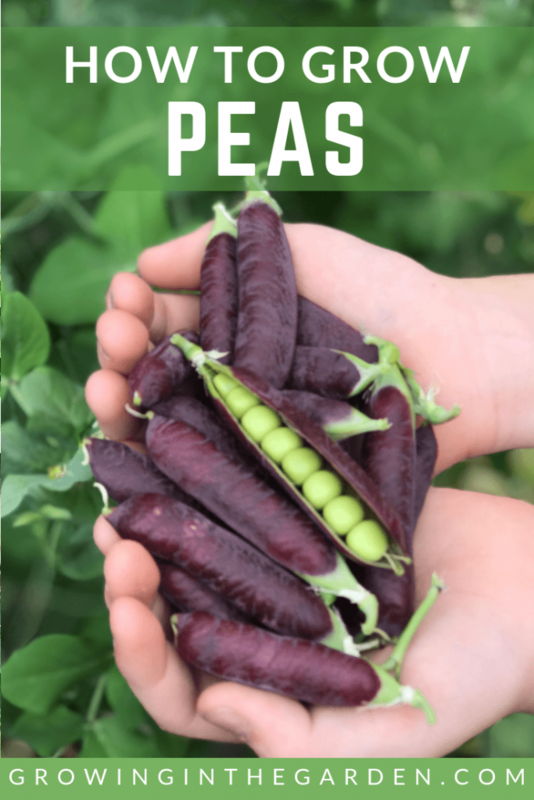 Read more about peas – planting, growing and harvesting peas. 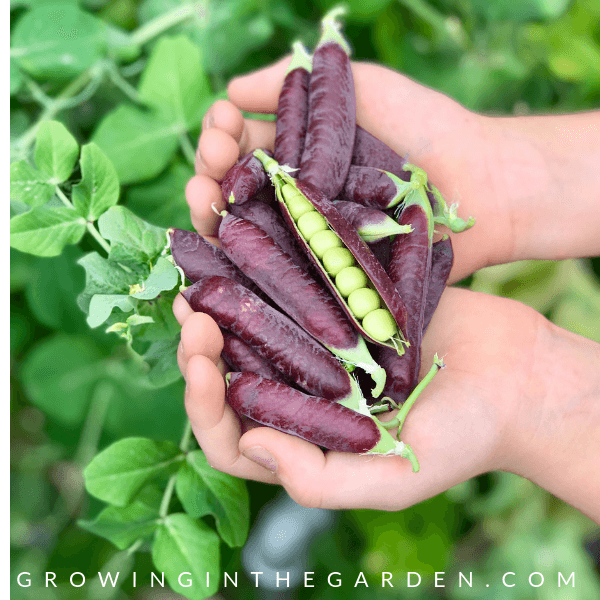 There are 3 different types of peas – choose which ones you want to plant. 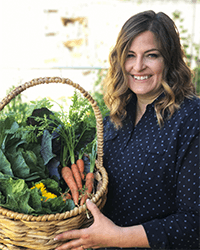 Once you have determined which type to plant, choose disease-resistant varieties if possible. Before planting peas, consider inoculating the seeds with Mycorrhizae. 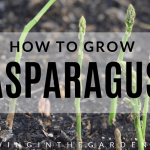 Inoculating the seeds gives the plants a boost, produces larger yields, and helps roots to ‘fix’ the nitrogen in the soil. Plant peas at the right time. Peas grow best at temperatures under 70 degrees. In Maricopa County, Arizona, plant peas beginning in September and continue planting peas until February. 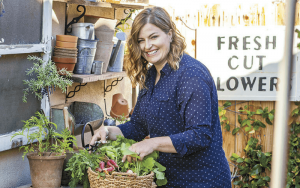 In other areas, for spring planting, plant seeds outside about 4 to 6 weeks before your last spring frost. Check your local planting guide to see if fall planting is an option for peas in your area. Peas grow best started outdoors. 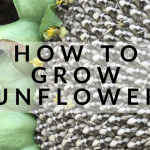 They have a fragile root system and it’s best to direct seed them. To avoid pests and diseases, rotate where you plant peas each year and do not plant in the same spot more than once every 3-4 years. Peas do best in loose soil that is not too high in nitrogen. Plant pea seeds 1 inch deep and about 2 inches apart. For square foot gardening grids, plant 8 peas per square. Watering is important for delicious peas. Pea plants do not like to be soggy, but it is important not to let them dry out either. 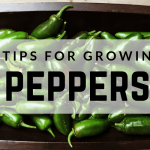 Provide regular watering, especially when plants are blossoming and producing pods. 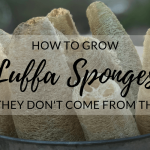 Pea plants do not require, nor do they want, extra fertilization. Too much nitrogen results in lush green plants, but few peas. Peas require phosphorus; if your soil is low in phosphorus consider adding bone meal. Pea roots are fragile and should not be disturbed. Do not dig around plants. 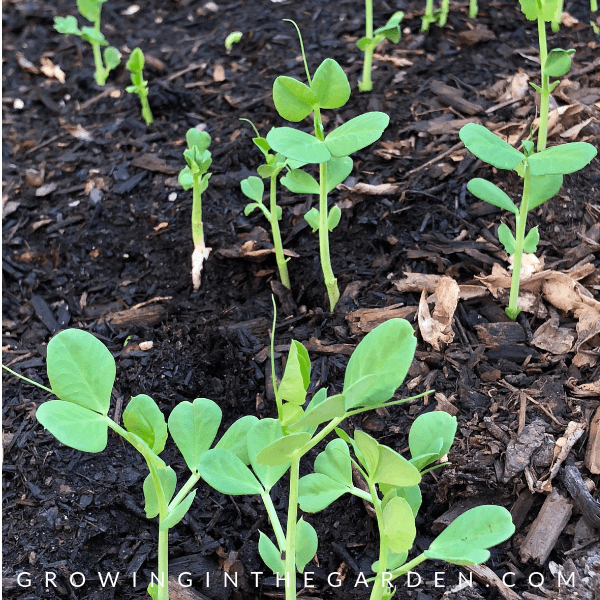 To control weeds and preserve moisture, mulch pea plants when they are about 2 inches tall. 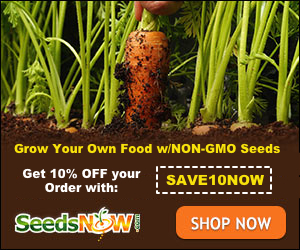 Provide support for growing pea plants. Provide a trellis for all peas, including bush varieties. Peas that grow on a trellis are more productive and less prone to root rot and other diseases. 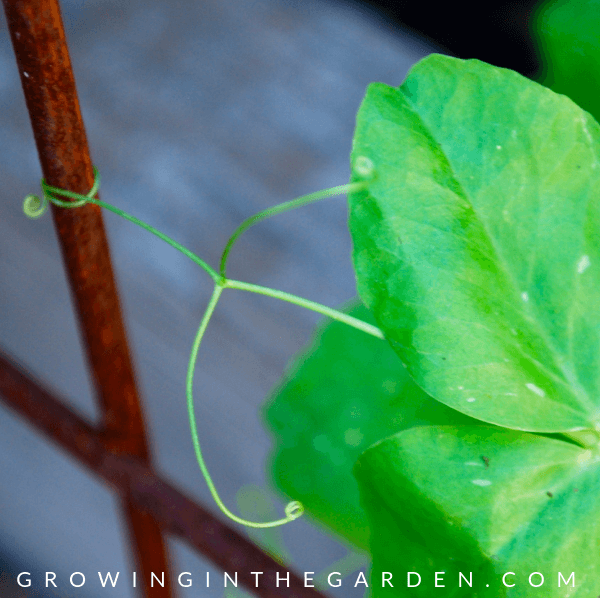 Peas’ tendrils reach out and love to climb. 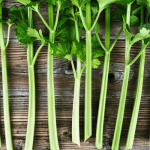 A stick in the ground near the plant allows shorter varieties to climb. 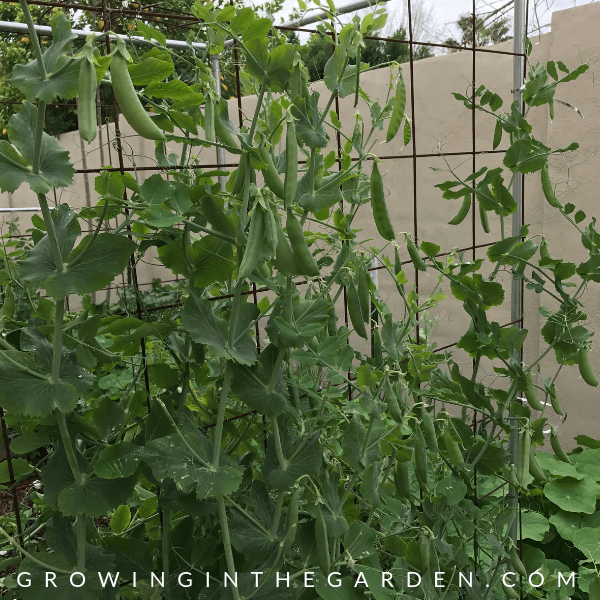 Provide a tall trellis for climbing peas. Guide the tendrils to the trellis, and once attached the peas will climb it quickly. 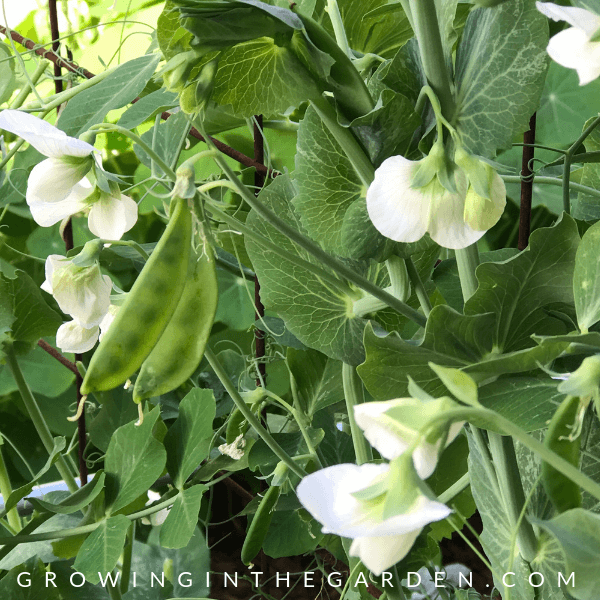 Harvest sweet peas when pods are round and bright green and shiny. Once pods become dull, they are fibrous and less sweet. 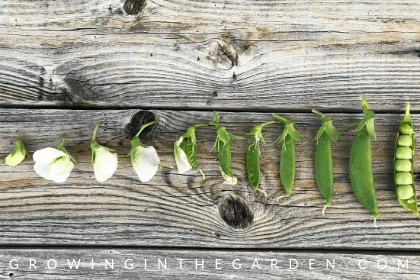 Harvest snow peas when peas are almost flat inside the edible pods. 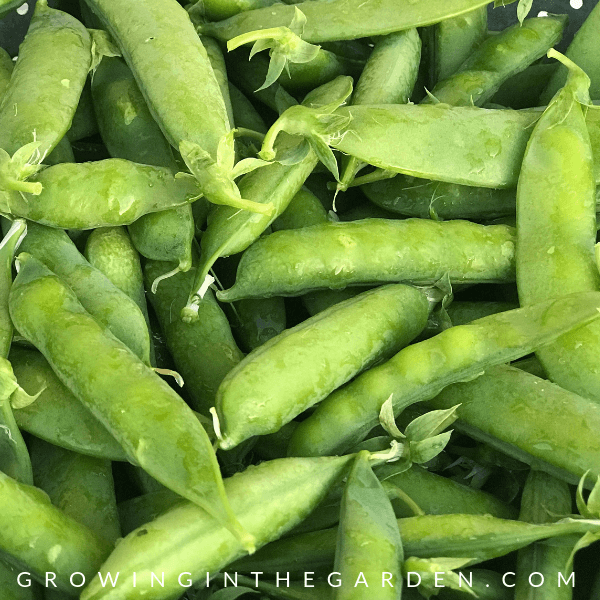 Sugar snap peas are best harvested when peas are well formed but are still small inside the edible pod. Harvest peas with two hands; use one hand to hold the vine steady and the other hand to pull off the pea. Harvest peas often to increase productivity. Do not leave overripe peas on plant; if peas are not picked this discourages production of new peas. At the end of the season, leave pods on plant until dry to save seeds if desired. When pea production ends, cut plant off at ground level and (if disease and pest free) add stems and leaves to the compost pile. Leave roots in ground undisturbed and as the roots decompose they will add nitrogen into the soil. Peas are sweetest when eaten fresh; the sugar in the peas turns to starch within hours of harvesting. Store peas for up to 5 days in the refrigerator in a paper bag placed inside a ziplock bag. Peas can be frozen or dried for later use, but the texture of the peas will change. 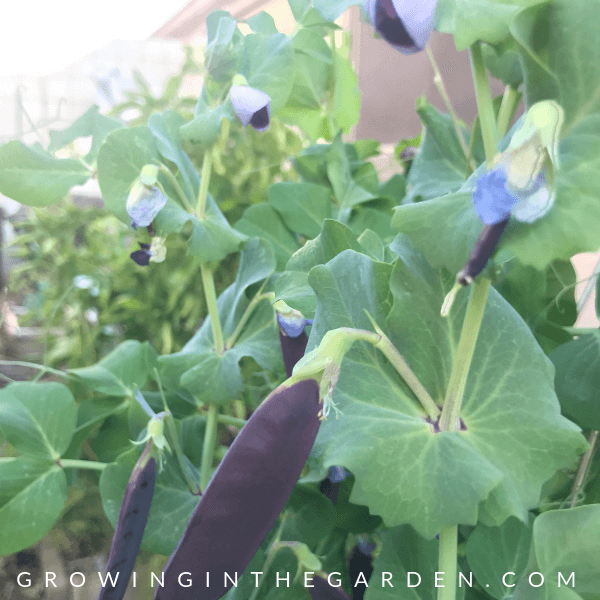 Want to learn more about growing peas? 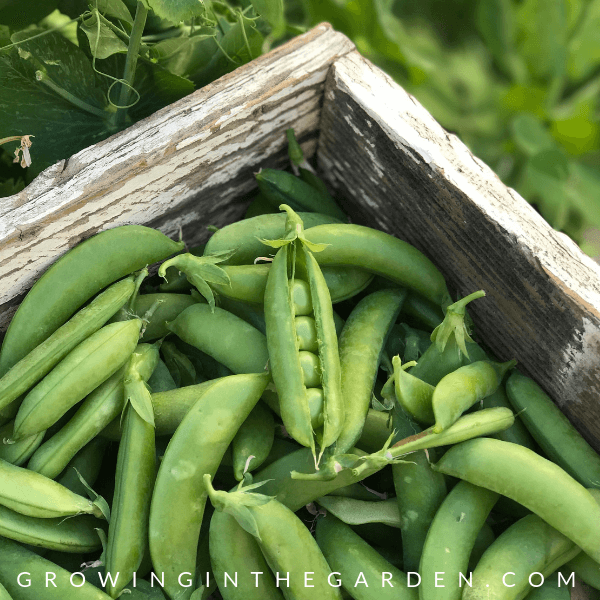 Now that you’ve learned to grow peas, check out this article I wrote for Garden Gate Magazine, explaining 5 great reasons to grow peas. 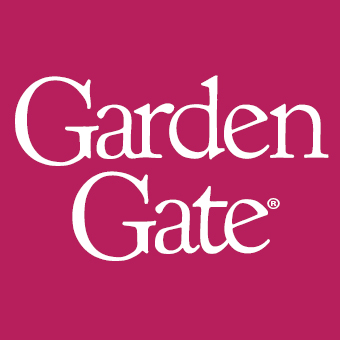 While you’re there, check out Garden Gate Magazine’s website. 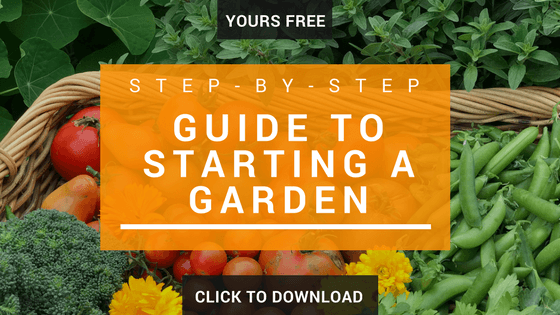 It’s full of useful information and garden inspiration. Best barieties of peas for low desert AZ? 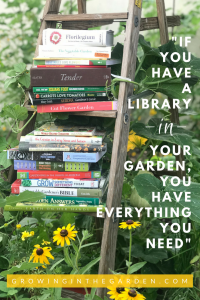 Any of the varieties I list in the post grow well here if planted at the right time, happy planting!